With so many contenders emerging for agricultural residue and fuel wood, biomass power plant owners are looking beyond national boundaries for viability. To make a profit they now look at carbon credits. “They are the plant’s lifeline,” Ranjan said. His power plant in Kota uses 1.4 kg husk for each unit of power that is generated; and for each megawatt generated in a year the company gets upto 7000 carbon credits from the CDM executive board, under the Conference of the Parties of the United Nations Framework Convention on Climate Change (UNFCCC). The Indian cdm basket includes a number of biomass projects. One third of the 133 companies that earn carbon credits are biomass power projects. But they are small in size and add up to only eight per cent of the total Carbon Emission Reduction (CER is the unit for carbon credit) India earns. These figures are from the climate secretariat website giving record up to November 2009. The 133 projects have sold 4,994,670 CER at the rate of US $ 17.7 per CER, about Rs 402.73 crore. The CDM benefit from biomass projects, roughly 6,500 CER per MW generated in a year, would amount to about Rs 52.41 lakh. 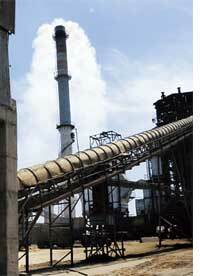 This means a 10 MW plant earns up to Rs 5.24 crore in a year in carbon credits. The only hindrance to more biomass-fuelled projects getting cdm benefit is that the raw material is not sustainable nor are the prices predictable. That is the reason the government has begun to promote biomass plantations, explained Chandram Mookim of Global Green Carbon Consulting Services, business consulting firm in Jaipur. Ranjan has plans of planting the legume weed Prosopis Juliflora. The plant’s appeal is that it grows fast; its wood can feed his power plant. “It fetches carbon credits as it is a carbon sink and the cost of biomass plantation brings down the price of a tonne of biomass from Rs 2,000 to Rs 500,” Mookim said. An official at MNRE said the ministry is implementing a UN Development Programme-Global Environment Facility-assisted project on Removal of Barriers to Biomass Power Generation in India. The aim of the project is to accelerate the adoption of biomass power technologies; it proposes removing barriers by promoting fast-growing trees and oil-bearing plants raised by local communities, he said. Taking its cue from the IISc study that mapped India’s potential for biomass energy, the ministry aims to generate 45,000 MW with fuel grown on 20 million ha of wasteland. One hectare it is assumed will yield 10 metric tonnes per annum of woody biomass.